Velký zpěvník - AJ: Akordy, noty a texty. The Ukulele From The Beginning Bumper Songbook is a fantastic collection of over 60 favourite songs, combining the first two Ukulele From The Beginning songbooks with the Christmas Songbookfrom the same series. Every song in this collection has been specially selected and arranged for those younger Ukulele players - around primary school age to early secondary school age. All of these songs will be well-known to most, so everything learned so far will be put into a fun and familiar context. Classically simple and timeless songs like Danny Boy and Swing Low, Sweet Chariot will be a joy to hear and play, as well as traditional melodies like Twinkle, Twinkle, Little Star and Scarborough Fair getting young Uke beginners playing straight away. As well as these traditional tunes, some festive favourites have also been included for that particular time of year when some seasonal songs are required. Christmas classics like Away In A Manger, Jingle Bells and O Come, All Ye Faithful are sure to get you in the seasonal spirit. 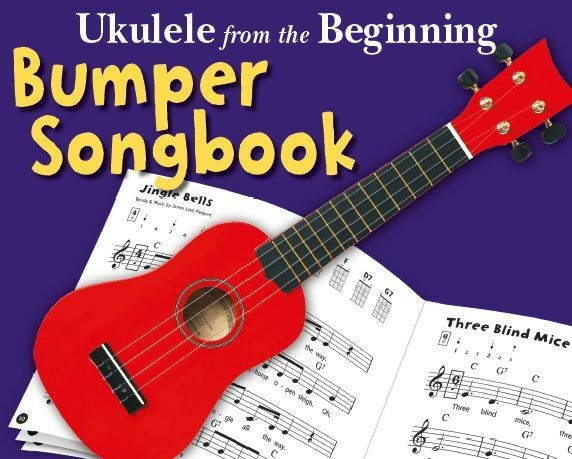 This Bumper Songbook has been compiled so that each song uses only the chords taught in the Ukulele From The Beginning Books 1 & 2. This makes the songbook the perfect partner for pupils working through that course, but also a great one for anyone learning the Ukulele who wants some simple tunes to learn and play. All of the songs in the Ukulele From The Beginning Bumper Songbook have been simplified and annotated with easy chord diagrams, strumming and picking patterns. Designed to be extremely accessible, this book will have you playing and singing along in no time at all.